Morgan Spurlock,director of Academy Award-nominated 2004 documentary film 'Super Size Me' puts himself into 1 month straight consumption of McDonald's fast food without exercising regularly. Anyone who is sticking with McDonald should watch the following movie. It came to my attention when doctors here told me about the realities of Fast food. My cholesterol level had gone up and caused a bit of arcus formation in my left eye. I was allured to fastfood in America and whenever i got time, i ate those burgers. It's okay now. I stay away from them. And, i came across this wonderful documentary after searching online. For healthy life, i also found to walk 6000-10,000 steps. Very soon, I'm getting one of those nifty gadget called Pedometer for myself. Besides i've a message for my Nepalese readers, if you are thinking good thing about Fastfood in USA, stop dreaming and help yourself by ignoring them. I'm not against any company or their products but when it comes to our life, i've to write them on. Since, it personally affected me, i found this video online and thought to share with my friends. The following video is more than an hour show and you should watch it how a director experimented with himself. Super Size Me is an Academy Award-nominated 2004 documentary film, directed by and starring Morgan Spurlock, an American independent ... all » filmmaker. It follows a 30-day time period (February 2003) during which Spurlock subsists exclusively on McDonald's fast food and stops exercising regularly. 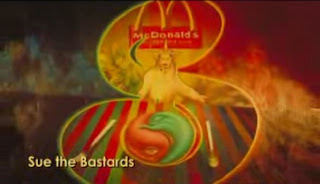 The film documents this lifestyle's drastic effects on Spurlock's physical and psychological well-being and explores the fast food industry's corporate influence, including how it encourages poor nutrition for its own profit. During the filming, Spurlock dined at McDonald's restaurants three times per day, sampling every item on the chain's menu at least once. He consumed an average of 5,000 calories (the equivalent of 9.26 Big Macs) per day during the experiment. In February 2005, Super Size Me Educationally Enhanced DVD edition was released. It is an edited version of the film designed to be integrated into a high school health curriculum. MSNBC has also broadcast an hour long version of the film, in addition to the regular version. oh, merdurian, then don't eat them very often every day. keep changing your meal to healthy ones.. even if you had them for a while.